The Boston Globe today received a threatening telephone call that is being taken seriously by local and federal authorities, according to an email sent by a facilities manager to other tenants at the newspaper's headquarters. 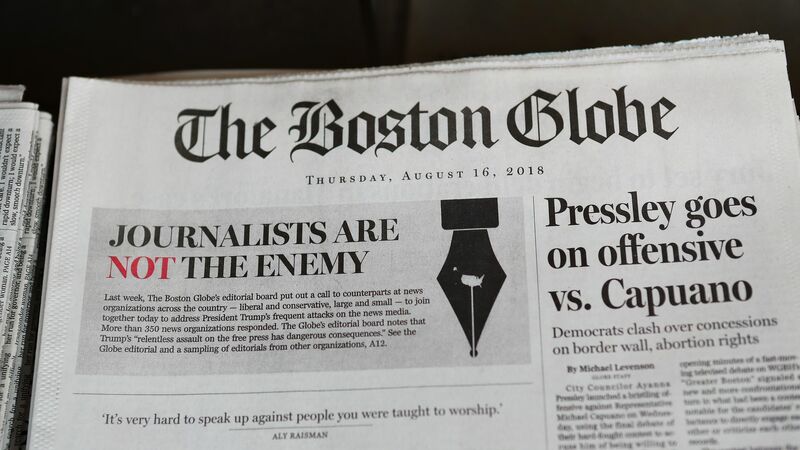 Big picture: The Boston Globe today published an editorial pushing back against President Trump's claims that some in the media are an "enemy of the people," and also helped coordinate similar editorials in 300 other papers. "Earlier today a tenant in the building, the Boston Globe, received several threats via phone call. Based on this threat the local and federal authorities have recommended some additional security measures for the property. For the remainder of the day you will see uniformed Boston Police officers in the lobby and around the property. There are very few specifics, but the threat was specific to later this afternoon." A Boston Police Department spokesman confirmed that it increased patrols around the Globe building, but said to call the FBI about any possible threat. The FBI declined comment, citing Department of Justice policy. "We are taking the advice of local and federal authorities who have recommended some additional security measures. The alarming turn of the president’s rhetoric -- the specific labeling of the press as an 'enemy of the American people' and the opposition party -- does cause us concern about media outlets and the stories we have heard around the country. Journalistic outlets have had threats throughout time but it’s the president’s rhetoric that gives us the most concern."